TBM GRAPHICS, LLC, founded in 2003, is an independent parts and service provider for the printing industry. Formerly with GRAFIX North America, we have over 18 years specializing in all GRAFIX brand equipment and over 25 years experience total in the printing industry. We specialize in UV Dryers, IR/HAK Dryers, Spray Power Units, and Chillers, and have experience on other brand accessory equipment: ELTOSH/GRAFIX, WEKO OXIDRY, TECHNOTRANS, BALDWIN, TRESU/ROYCE, HARRIS BRUNO, PRINT CONCEPTS, DR.HONLE, IST, DRY STAR, AIR MOTION. Experienced in working with HEIDELBERG, MAN ROLAND, KBA, KOMORI, MITSUBISHI printing presses. ​TBM offers on-site and off-site services. TBM provides on-site service for various makes of press accessory equipment including UV, IR/HAK, Chillers and Sprayers. TBM also has engineered changes to on-site equipment to improve performance and reduce downtime. TBM offers an extensive rebuild service for final and interstation UV and IR/HAK cassettes. UV rebuilds include engineering modifications to reduce occurrence of faults and improve performance of the overall unit. Our methods are tried and true with years of sustained production. Our off-site service saves expenses associated with on-site calls. TBM is an authorized distributor of several OEM parts including blowers, drives, and electrical components. We carry most wear items in stock. Please visit our parts page for more information or give us a call for a quote. 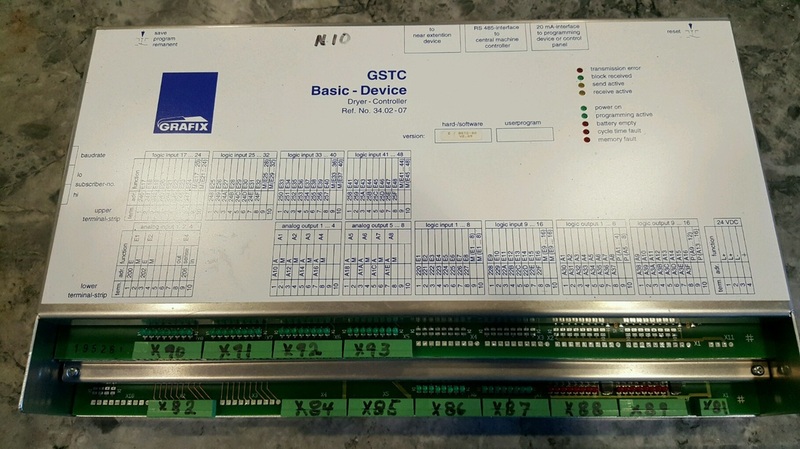 GRAFIX GSTC KLASCHKA PLC & CONTROL SCREEN has been successfully repaired and upgraded for several customers over the years. GRAFIX CHILLER PLC and component upgrades will keep your chiller working like new. TBM also upgrades the GRAFIX UV System to address various faults to prevent costly downtime.